Young Anthony Patch is handsome, and Harvard educated. The grandson of an industrialist turned reformer, he has a steady income that buys him a comfortable life style. He doesn’t think women are suitable companions for him until he meets Gloria Gilbert, a dazzling beauty who is a force of nature. They court, marry, and begin a life of over-the-top partying and entertainment that within years diminish their income considerably. Then WWI erupts, and as Anthony experiences life in the army, his disillusionment sends him into a downwards spin that ends in alcoholism. I finished The Beautiful and Damned by F. Scott Fitzgerald last night and ever since I have been wondering how to approach my review. It was a great story, though not a great novel. The era portrayed is the Jazz Age, as was in The Great Gatsby, from 1911 to a few years after WWI. If The Great Gatsby is a tightly woven novel, evidence of a writer at the peak of his game, portraying the lights and shadows of an era, in The Beautiful and Damned we see the sophomore work of a writer, portraying mainly the shadows. Its sentences are lyrical, beautifully constructed, with very accessible language. The novel has three parts, each consisting of three very long chapters. 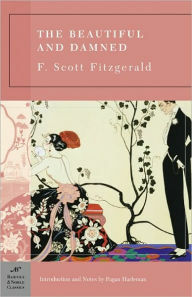 Fitzgerald spikes the dialogues with keen observations about life and human nature, leaving, at least in the first part of the book, no other choice than to chuckle; he also peppers the dialogues with cynicism—rare among the young and privileged—, that increase in frequency and somberness as the novel progresses. Perhaps the book should have benefited from a tighter edition process though I’m not sure I would change anything in the telling of the story, except perhaps less Maury Noble’s and Anthony’s ramblings on literature, philosophy, and the stupidity of women. As I said, the editing should have been tighter, but I wouldn’t change a thing in the telling of the story. The first part describes Anthony Patch’s lavish life as a bachelor with a steady income, his courtship with young, beautiful, and reckless Gloria Gilbert, and their marriage. In the second part, WWI erupts and Anthony, guided by a false sense of patriotism, enrolls in the army. In the third part, Anthony comes back from the army to face his and Gloria’s ever diminishing fortune, and they fall from good society while he descends into alcoholism. The second and third part of the novel are increasingly somber in mood, because Anthony’s decline into alcoholism is slow and we get front seat into what is like to be in the life and mind of an alcoholic. We also get front seat into the decline of a marriage. It is not pretty, and makes for a difficult reading. The Beautiful and Damned is a character study rather than the portrayal of an era. It is also a class study. It emphasizes the class divide, how the young, beautiful, and rich feel that life is an endless sea of possibility but don’t feel the need to work towards a goal. Anthony and Gloria are young and beautiful when the novel begins, and they worship those assets as well as money above all else. As they grow older, particularly Gloria feels that her life doesn’t have much meaning once she loses her beauty, which is her trademark in good society. As their fortune dwindles, they realize that the only thing they have is each other, and they don’t even like each other anymore. The beautiful has become damned. Despite the numerous criticisms I attached to this novel, I really liked it, and the ending was so fitting that made me say wow. While The Beautiful and Damned is no Gatsby, it has its own merits, and gives a glimpse into the creative process of a literary icon. Wonderful review. It brought it all back for me. Thanks, Judy! I'm glad you liked it. Excellent review. One really gets a feel for the work. I've never read this particular Fitzgerald novel although we've had a copy of it on our shelves for as long as I can remember. Maybe I need to take it down and dust it off. Thanks, Dorothy! I recommend you do. I have read three of Fitzgerald's novels now and I'm afraid this was the least enjoyable for me. This was nothing to do with the quality of writing, but mainly due to the fact I could find little to nothing to like about the characters. I liked them in the first part. I laughed almost constantly in that part as well, but as the novel progressed the characters became dislikable indeed. Thanks! It's no Gatsby but it has its own merits. Excellent review Carmen. I have not read this particular Fitzgerald novel but in Dec. 2015 I reviewed his novel Tender Is the Night which has a similar trajectory of the characters. The couple starts off rich & happy and then there's a slow & tough demise, and the marriage fails. He's got that plot down! Thanks, Susan! He surely does. I have Tender Is the Night scheduled for March. I read that it's considered a near-masterpiece. If you say it is similar now I have doubts on whether I want to read it or not. Maybe only to appreciate his writing style. I feel quite ashamed - I haven't read any Fitzgerald. Would you say Gatsby first? Don't be ashamed! You have read many classics, and I read Gatsby not that long ago. Yes, start with Gatsby and if you like it you can continue or not, but that's the book to read by him.